SPEC Flywheel - Steel - Pann Auto Performance - San Diego largest aftermarket automotive performance parts - What do you drive? 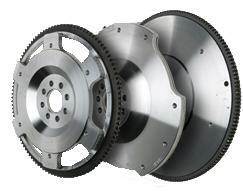 The automotive component most responsible for insuring optimum clutch performance and life is the flywheel. The flywheel’s contribution to power transfer is three-fold. To allow for specific inertia needs, SPEC flywheels are made in high carbon billet steel and aircraft quality billet aluminum. The aluminum and most steel SPEC units are rebuildable and feature a replaceable steel friction plate that is made from a friction- enhancing steel metal specially formulated for optimum clutch bedding and holding power. The aluminum and steel materials provide a light and medium weight option for all types of racing. SPEC spends a lot of time and effort on research and development of optimum flywheel dimensions and weights for all types of driving and racing and can optimize your MOI (moment of inertia) to maximize your car’s output and performance.